Slaws are often relegated to my sad side category; nothing terrible, yet nothing terribly exciting. As a slaw skeptic, my common BBQ practice is to bypass the slaw in favor of more enticing sides. Why waste coveted paper-plate space on a bowl of shredded cabbage when faced with juicy slices of watermelon or bacon potato salads?!? 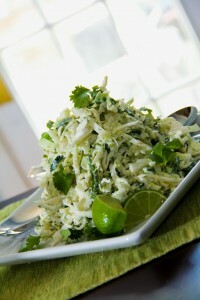 I recently, however, discovered this cilantro lime slaw and am reconsidering my classification of slaw as a sad side. This cilantro lime slaw is not only a crunchy and refreshing condiment for pulled pork or fish tacos, it is an amazing side all on its own. I recently served this slaw as the perfect accompaniment for green chili cheeseburgers and a warm Mexican street corn salad, and then piled the leftovers on grilled fish tacos the following night. Confession of a *wannabe* foodie…. Although this slaw has initiated my conversion, I still don’t love all slaws, but I will now at least give them a try! In a small bowl, whisk together: mayonnaise, sour cream, lime juice, lime zest, minced garlic, and minced serrano chili. In a medium bowl, stir together: sliced cabbage, sliced poblano chili, green onions, and chopped cilantro. Pour the dressing over the cabbage mixture and toss until well coated. Refrigerate the slaw for an hour or up to 1 day. Squeeze fresh lime juice and season with salt and pepper, as needed, prior to serving. Just made this last night, it was great! Left out the green onions because a friend despises them and it still tasted great! Thanks for the great recipe.